This is a question that I have received quite a few times, and this time I thought I would get some screenshots and detail the process a little bit in here so that other folks can take advantage of this info as well. First of all, what is the “Remove Duplicate Results” feature? It is a feature that tells the search engine to collapse results that are perceived as duplicates (such as the same document located in different paths), so that only one instance of the document is returned in the search results (instead of showing the multiple copies to the end-user). Now let’s investigate how this feature works. To do this, we will go in reverse order (from search to processing) to understand all the pieces involved. Note: the querylog shown above has some query parameters removed so we can focus on the items that matter to duplicate removal. onproperty – Specifies the name of a non-default managed property to use as the basis for duplicate removal. The default value is the DocumentSignature managed property. The managed property must be of type Integer. By using a managed property that represents a grouping of items, you can use this feature for field collapsing. keepcount – Specifies the number of items to keep for each set of duplicates. The default value is 1. It can be used for result collapsing use cases. If TrimDuplicates is based on a managed property that can be used as a group identifier (for example, a site ID), you can control how many results are returned for each group. The items returned are the items with the highest dynamic rank within each group. includeid – Specifies the value associated with a collapse group, typically used when a user clicks the Duplicates (n) link of an item with duplicates. This value corresponds to the value of the fcoid managed property that is returned in query results. As you can see, the type of this managed property is Integer (which the MSDN article defined as a requirement) and it is also configured both as Sortable and Queryable. The peculiar thing is that when looking at the crawled properties mapped to this managed property we get nothing as a result, which indicates that the value for this property is most likely being computed by FAST Search for SharePoint during content processing. During content processing, for every item being processed, FAST Search for SharePoint will obtain the value of title and the first 1024 bytes of body for this item, and use it to compute a numerical checksum that will be used as a document signature. This checksum is stored in the property documentsignature for every item processed. During query time, whenever “Remove Duplicate Results” is enabled, the Search Center tells FAST Search for SharePoint to collapse results using the documentsignature property, effectively eliminating any duplicates for items that have the same title+first-1024-bytes-of-body. When a user clicks on the “Duplicates (n)” link next to an item that has duplicates, another query is submitted to FAST Search for SharePoint, passing as an additional parameter the value of the fcoid managed property for the item selected, which will be used to return all items that contain the same checksum (aka “the duplicates”). Is it possible to collapse results by anything other than documentsignature and use this feature for other types of collapsing (collapse by site, collapse by category, etc.)? Can two items that are not identical be considered as duplicates? Can I change how the default document signature is computed? Answer: Yes, read the update to this post below. No, since this is done by one of FAST Search for SharePoint out-of-the-box stages. But, what you can do is calculate your own checksum using the Pipeline Extensibility and then use your custom property for duplicate removal. When you have duplicates and only one item is shown in the results, how does FS4SP decides which item to show? Answer: The item shown is the item with the highest rank score among all the duplicates. That’s it for today. If any other questions related to duplicate removal surface after this post is published, I will add them to the list above. UPDATE (2011-12-09): Yes, you can influence how document signature is computed! After I posted this article yesterday I was still thinking about that documentsignaturecontribution property mentioned, as I had a feeling that there was a way to use it to influence how the document signature is compute. Well, today I found some time to test it and yes, it works! Here is how to do it. What you have to do is create a new managed property with exactly the name documentsignaturecontribution and then map to this managed property any values that you also want to use for the checksum computation (as with other managed properties, to assign a value to this property you must map a crawled property to it). You need a managed property because the DocumentSignature stage is executed after the mapping from crawled properties to managed properties, so FAST Search for SharePoint is looking for a managed property named documentsignaturecontribution to use as part of the checksum computation. When you create this managed property and assign it some value, FAST Search for SharePoint simply uses this, along with title and the first 1024 bytes of body, to calculate the checksum. Mikael Svenson’s post on how to use PowerShell to create quick-and-easy custom processing components. Excellent explanation and I wrote about the 1024 limit before in the MS forums back in July (http://pzl.no/syFN8O). In my opinion they should have done a CRC32 on all the content instead of just the first 1024 characters. I suspect larger organizations with a lot of appendixes, contracts etc will see duplicates where it actually isn’t. And what content goes potentially into “documentsignaturecontribution”? “Remove Duplicate Results” works in FAST Search for SharePoint | Search Unleashed” with my personal buddies on facebook. I personallysimply planned to disperse your wonderful posting! Thank you for this very helpful explanation. Do you know if these arguments also apply to the Search Server (which is integrated in SP 2010) or only to FAST Search? I tried to manipulate the fcoid like you did, but it didn`t work, still getting duplicates in my search results. 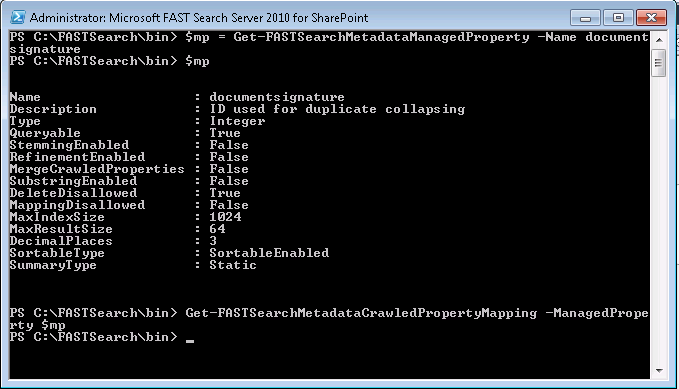 I’m not sure about how all of this works with Search Server, but considering that this collapsing functionality already existed in this form with FAST ESP (which was the basis for FS4SP), I wouldn’t expect Search Server to have it implemented in the same way. I’m interested in making a making my own managed property and having FAST use that to filter duplicates instead of documentsignature. I have successfully created my crawled property and mapped it to a custom managed property but I’m having trouble understanding how to incorporate that into my search results. You mentioned “a custom web part (or an extended Search Core Results Web Part) where you request this managed property”. Will that have to be entirely custom, as in logic for checking if a document is a duplicate in the xslt or the web part? Or is there a way to simply sub-in my managed property? I’m sorry my post isn’t too clear on this. What I meant to indicate is that (at the time I researched this in FS4SP 2010), the only option you had to replace which managed property should be used for duplicate removal, was by setting the appropriate parameter when making requests using either the Query Object Model or the Query Webservice. 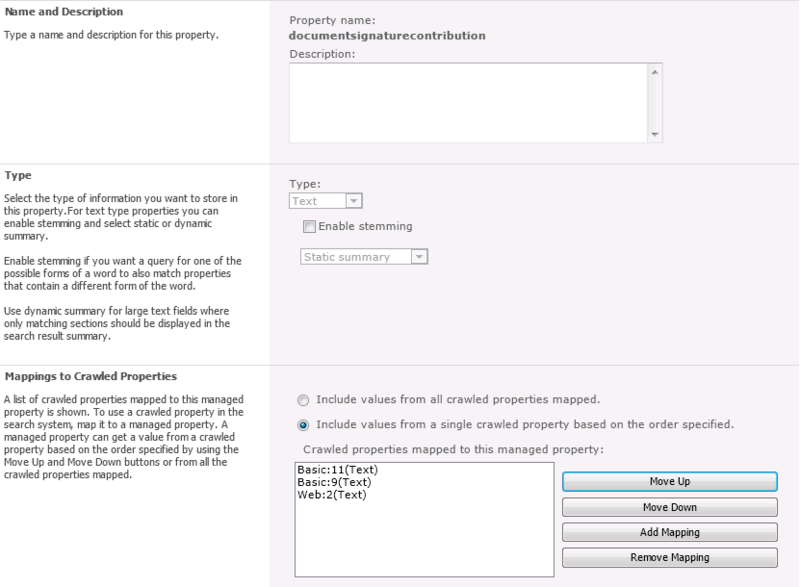 There was no way I could find at the time to define the duplicate removal managed property in the ootb web parts, which meant that you would have to develop a custom web part (probably extending from an existing one) in order to be able to modify this setting to use your own custom managed property. Good to know, Thanks Leo! Thanks for answering my previous question, I’ve got another for you. Let’s say I have three urls: mysite.com/one, mysite.com/one/two, and mysite.com/three/one. What I was trying to do by viewing this post was collapse results so that if a user searched for “one” they would see two results: mysite.com/one and mysite.com/three/one. Since mysite.com/one/two is a sub site of mysite.com/one, it wouldn’t get returned even though these sites wouldn’t be duplicates. Is there a way to configure this kind of result collapsing in FAST that you know about? That’s a great question, Daniel. From what I understand then, it seems like you would like the collapse to happen based on the URL structure of your site, in a way that the results coming from the same level of the URL structure (mysite.com/one and mysite.com/one/two) would then be collapsed. In this case, if you have both mysite.com/three/one and mysite.com/three/one/four, then the collapse would happen as well. Also remember that the when duplicate removal is applied, the result that it is returned is the one that has the highest ranking score. This means that in order to ensure that a specific record would be returned instead of the other, you would have to somehow define a boost/sorting option to make sure the item you want would be returned first. Last, if I understood this wrong and you want to do something else entirely, then just keep in mind that in order to use duplicate removal, all you need is some managed property that has a value to be collapsed on. I know sites that collapse based on URL structure (such as Google, which sometimes will return just the top URL for a site, if there are multiple matches within the same site), order search applications collapse based on category (such as a news site collapsing news from the same category, to allow the user to see articles across multiple categories), etc. The only requirements are the managed property, and customizing the search request to use your specific managed property for duplicate removal. I have a problem with displaying duplicate. I nocited that when I clik duplicate(n) there is no result and i get “Scope in your query does not exist”. However, if I click Edit Page and after Stop Editing I can see duplicates. I didn’t change anything in Edit Page mode, so I’m confused and have no idea how to resolve it. Have you any idea what is going on. I found that the problem is related with url. For some reason, url contains lots of space. If the space is right after “All%20Sites” the url is read in wrong way and the result is not dispaly. Have you any idea how the link Duplicates: (n) is generated? This line of code make this bug, Somebody added tab before &dupid=. I’m sorry about the delay in getting back to you on this, Claudia. But I’m happy you figured out the problem! These small mistakes are the really tough ones to detect. A truly great post. I’ve learned a lot from it. I just wrote a post with a description of removing duplicates on the standard sharepoint search results page, not only in the Search Center. It’s great that you posted info about how to do this with a standard SharePoint search results page, as this is definitely something that isn’t that easy to find!